The patient is a 67 years old female who presented with multiple pulmonary masses. She was noted to have weight loss of 37 pounds over past 4 months, and multiple cutaneous nodules on her lower extremities. Left lung lobectomy was performed. On gross examination, multiple nodular lesions were identified within the lung parenchyma. 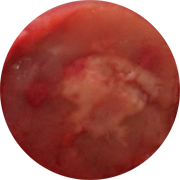 The largest lesion measures 3.4 cm in diameter. Central necrosis was noted within the nodules. 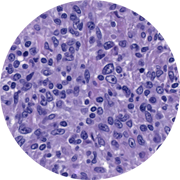 Histologic examination demonstrates the nodules have a polymorphic cellular composition, and are composed of a mixture of small and large lymphoid cells, scattered histocytes and plasma cells. Large areas of coagulative necrosis are seen. The large atypical lymphoid cells are positive for CD20. By in situ hybridization, EBV-positive cells are numerous, and focally forming small confluent sheets. A diagnosis of EBV positive diffuse large B-cell lymphoma is made. In addition, the neoplasm can be classified as lymphomatoid granulomatosis, grade 3.